Leave the computer at home—with the CD-2u SD/CD Recorder, it’s easier than ever to capture quality recordings and play and burn CDs anywhere! Record audio instantly with the built-in stereo mic, or connect your own external mics, electronic musical instruments, and other devices with professional results. Onboard are many training tools for lessons and practice, including CD and WAV audio playback, high-fidelity key and speed adjustment, improved Center Cancel, and the all-new Center Focus. Essentials such as a chromatic tuner and metronome are included as well. Ultra-compact and easy to use, the CD-2u is your perfect solution for playing, recording, and CD burning in a convenient mobile package. With its compact size and ability to run on battery power, the CD-2u is your go-everywhere companion, giving you everything you need to record, edit, play, and burn in one standalone unit. The built-in stereo mic makes audio capture easy, while high-performance stereo speakers provide convenient sound playback of your recordings as well as commercial CDs, lesson material, and more. The CD-2u records to readily available SD/SDHC cards, and can also record directly to CD-R and CD-RW discs when using AC power. Thanks to the Easy Guide feature, the CD-2u is incredibly simple for anyone to operate, with clear onscreen instructions that guide you every step of the way. Easy Guide covers not only recording functions, but also CD backup, creating minus-one tracks for practice and karaoke, setting proper input levels, and other operations. You can even choose among six different languages for the display: English, German, French, Italian, Spanish, or Japanese. While it’s designed for pro results as a standalone unit, the CD-2u also provides connections to integrate external devices for various applications. Two XLR/TRS combo jacks allow you to connect your own mics (with phantom power available if needed), including a stereo field-recording mic such as the CS-15RS. There’s also a stereo mini-mic jack with Plug In Power, plus stereo RCA LINE IN jacks for connecting an instrument, music player, or other audio sources. The CD-2u is packed with useful tools not only for developing music skills, but also other applications such as learning languages, transcribing spoken-word audio, and more. You can independently adjust the speed and key with exceptional audio quality, perfect for slowing down passages to learn difficult parts or changing the key of music to match your voice. Use A-B Repeat to play audio sections over and over, and turn on Center Cancel to create minus-one tracks for practice and karaoke fun. There’s also the newly developed Center Focus feature, which isolates center-located sounds in music tracks to make them easier to hear and learn. Once you experience the CD-2u, you’ll want to take it with you everywhere. The optional CB-CD2E Carrying Case gives you durable protection, plus handy storage of accessories like CD and SD media, batteries, remote, etc. And if you love all the great features of the CD-2u but don’t need CD playback/burning capability, be sure to check out its cousin, the SD-2u SD Recorder. * Maximum recording time of one song is 74 minutes. The time may vary according to usage conditions, batteries used, and type of SD memory card used. Fugue © 1999-2013 Kyoto Software Research, Inc. All rights reserved. 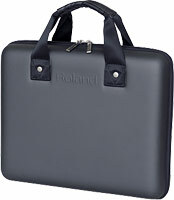 Transport your Roland CD-2u/CD-2e in style. Cardioid-type stereo microphone compatible with portable recorders such as the CD-2u, SD-2u, R-26, and R-05.